I was thrilled when the wonderful group of moms from Worldwide Culture Swap grouped together individual families for a one-on-one culture swap exchange. We have yet to sit down, and go over all of the items in our swap package. However, my son did enjoy eating his sweets, and looking at the animal postcards. He loves animals! 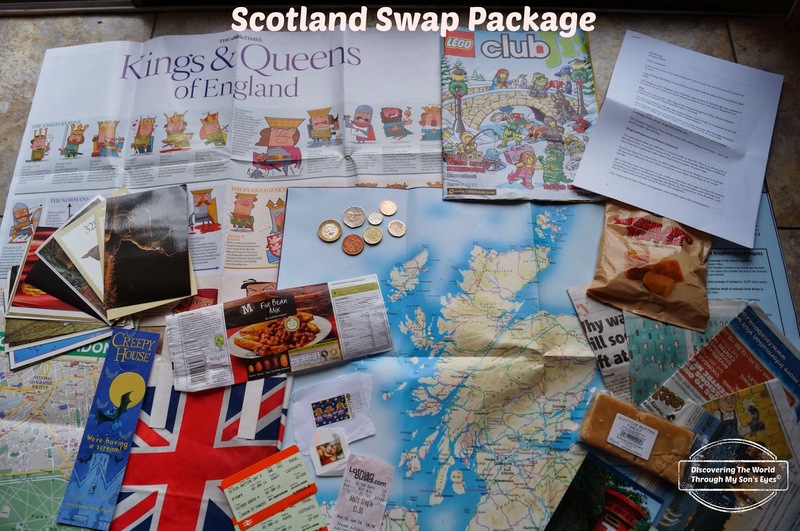 In the coming weeks we’ll be going through every single piece of item in the swap package, and learning about Scotland. As for us, we sent a swap package with items from Puerto Rico. I had been waiting to participate again since this past summer when we returned from a 2-week vacation in Puerto Rico. I came back with so much goodies, and scouting all the tourist areas for the magazines. We included in our package a personalized letter from us, a short letter from little man with petroglyphs drawings that he made. The tourist magazine ¡Qué Pasa!, copy of a traditional children’s games in Puerto Rico found in the children’s book Shake It, Morena!, coquí key chain, Puerto Rico cup holder, maracas, small cemí replica, history fact on Puerto Rico, information on the Taíno indians (natives of Puerto Rico), picture postcard, a capia, and of course, sand from the beach in Culebra, PR. 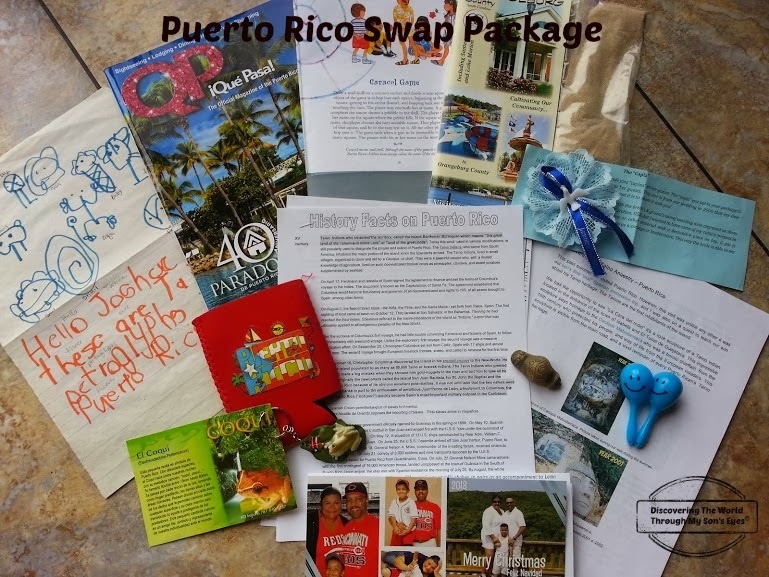 We’ve participated in the past, and we have learned so much from the families who have carefully prepared, and put together the swap packages from their countries (read about it here). This was a one-on-one culture swap package. We signed up for a 4 family swap package, and we’re group 208 swapping cultural packages with Poland, Sweden, Canada, and New Jersey. We’ll be anxiously waiting for our mailman and hoping to receive a culture swap package soon. Until our next swap! How do you teach your children about other cultures, and countries? Have you participated in culture swap exchanges? Please comment below, share and/or pin! Love these swaps! So much fun! I love reading about culture swaps – I've been wanting to participate for a while but our mail is so unreliable. I'll have to see how things go with our new post box. It looks like you are going to have a great time exploring Scotland and I love all the goodies you brought back from Puerto Rico!